Duane moved to Spokane from Santa Fe, New Mexico where he was the Associate State Director of the NM Small Business Development Center for more than seven years. He has more than 20 years experience with the Small Business Development Center program, serving in various administrative, consultant and management capacities. In addition he has more than 10 years experience as an entrepreneur in agriculture. 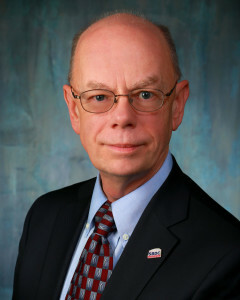 He is currently a member of the National Association of SBDCs Accreditation Committee, and was a Malcolm Baldrige examiner for Quality New Mexico. He is certified by the National Development Council as an Economic Development Finance Professional and recently completed training by the Palladium Group on the Balanced Scorecard. He has a Bachelor’s Degree in Business Administration from Sioux Falls College in South Dakota and a certification from the Information Technology Institute in Denver, Colorado as an Information Technology Specialist. Before joining the Washington SBDC, Sheryl was president of the Washington Agriculture and Forestry Education Foundation. Previously, she served as an administrator and senior legislative aide for the City of Spokane and has held several top leadership positions for nonprofit organizations including President & CEO of the South Snohomish County Chamber of Commerce. Sheryl also owned and operated her own full service restaurant in Spokane for five years. She holds a Master’s degree in Interdisciplinary Studies from Eastern Washington University and actively participates on multiple Boards and committees state-wide. Craig joined the Washington SBDC in February of 2018. Craig provides fiscal oversight and comprehensive administrative management. His responsibilities include grants and contracts administration, and he is involved in budget and planning. Craig advises and acts as a contact concerning fiscal and personnel issues relating to the SBDC. Craig has many years of experience in higher education and non-profit research providing fiscal and administrative oversight including managing grants, budgets and staff. He was most recently a Budget Finance Manager at an applied research center at Washington State University. Tim joined the WSBDC in April of 2012. He recruits, trains and works with university student interns to do Market Research. The Research Team provides research services for the WSBDC network, assisting the Certified Business Advisors’ and the International Trade Specialists’ clients gain market intelligence specific to their expansion plans. Prior to joining the WSBDC, Tim has worked in the Emergency Medical Services field, at General Dynamics-itronix on an R&D engineering team and owned his own retail business, after retiring from 20+ years of government service. Cindy joined the WSBDC in February of 2008. She facilitates the state training programs, coordinating events and professional development. She also administers the state web site. Prior to coming to the Washington network Cindy worked for at the Spokane SBDC supporting the business advisors and the small-business training program in cooperation with the Community Colleges of Spokane. Stacey joined the WSBDC in December of 2015. She provides marketing and outreach for the statewide network. Prior to joining the WSBDC, Stacey’s most recent work was in marketing and advertising. For the past five years she has been working with Comcast Spotlight, first in Spokane and later in Albuquerque as the Marketing Manager. She is a graduate of Eastern Washington University with a Bachelor’s in Business Administration, Management. Craig joined the Washington SBDC in June of 2018 and provides fiscal and administrative support for the Lead Office and the statewide network. Prior to joining the Washington SBDC, Craig worked in a payroll and purchasing capacity at WSU Pullman, as an educator in Montana, and as a Storekeeper in the United States Coast Guard. He is a graduate of Montana State University – Billings with a Bachelor’s in History and a K-12 teaching certificate.